After getting a glimpse of the compact SUV 'Tata Nexon' at the 87th Geneva International Motor Show in Switzerland last week (which brought us Honda Civic Type R and Suzuki's New Gen Shift), it was not clear whether it was just a show car or actually going to the production line. 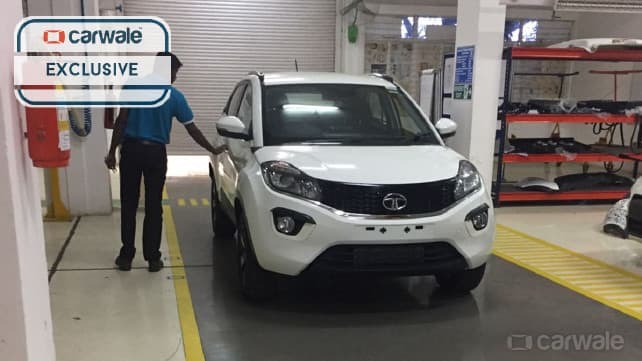 However, putting all the rumours to rest, folks over at Carwale have shared pictures of the TATA Nexon, fresh off the production unit. And from the looks of it, we have to say that it's a compact crossover that falls into the hatchback segment more than SUV. It's now being speculated that after launching Tata Tiago AMT, we might see Tata Nexon hitting the streets by next month end. Coming to the features & top tech specs, the Tata Nexon sports a 1.2-litre turbocharged Revotron petrol engine and the the 1.3-litre Multijet diesel engine. Initially, we will see the car hitting the streets with a manual gearbox, but eventual AMT options are quite probable. In the image above, you will note the projector headlamps, front fog lamps and the signature smiley design with a more aggressive looking black honeycomb-mesh grille. There are black and silver five-spoke alloy wheels, LED-turn-indicators featuring body-coloured mirrors, roof rails and roof-mounted antenna in the rear end. Among the interior features, the one to take notice are - keyless entry, a touchscreen Harman infotainment system with navigation and Bluetooth connectivity, automatic climate control, front dual airbags, steering mounted controls, ABS with EBD with Corner Stability Control for safe drive and ISOFIX mounts at the rear seats. Once on the Indian roads, Tata Nexon will compete against the likes of Maruti Baleno, Ford EcoSport, Mahindra TUV 300 and Honda Jazz. The expected price is ~ Rs. 7 Lakh. What are your thoughts and expectations from the all new TATA Nexon? Share with us in comments below.